Hyundai adds to the Elantra lineup with a new 5-door Touring model. Originally sold in Europe as the i30cw, the Elantra Touring is now available in the US. Although the exterior styling bears little resemblance to the Elantra sedan sold in the US, the interior should look familiar to Hyundai owners. As on the sedan, the Elantra Touring is equipped with the 141-bhp 2.0L I-4 coupled to a choice of a 5-speed manual or 4-speed automatic. Wheel/tire combinations include 16-inch or 17-inch alloy wheels shod with P205/55HR16 or P215/45VR17 tires, respectively. Hyundai retuned the suspension and steering system for a sporty driving experience. Electronic Stability Control (ESC), ABS, and traction control are standard. The Elantra Touring is comprehensively equipped, but the few available options include heated front seats and a sunroof. Hyundai adds a new five-door hatchback Elantra Touring model. Although the Elantra name is used, it the model is actually based on a European product. 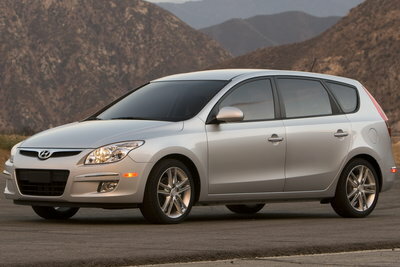 The Elantra Touring is equipped with the 141-bhp 2.0L I-4 coupled to a choice of a 5-speed manual or 4-speed automatic.